William Hague has told representatives at the Tory conference to remain optimistic the party can change and "leap-frog Labour into the future". In a joke-filled rallying cry the ex-leader said the Conservatives should strive for educational excellence and social cohesion. It should be more representative of the nation in all its "glorious diversity". He praised the five leadership contenders, saying they have "the makings of a most formidable team". "Any one of these five makes Gordon Brown's lacklustre speech in Brighton last week pale into obscurity," he said. He told the party faithful that they should not be afraid of one leadership election lasting eight weeks. Labour was facing a contest lasting three years "with one increasingly discredited candidate", he said. He also poked fun at the Liberal Democrats for entering into a leadership race over four years with "no candidates at all". 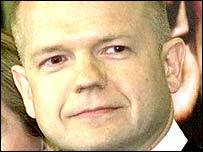 Mr Hague addressed the Blackpool conference after Liam Fox, the last of the leadership contenders, made his pitch for the top job.